A passionale was a book of stories of martyrs which was read from during the early morning prayer services of canons, monks and nuns. Each reading would be followed by short sung verses. From Christ Church cathedral, Canterbury, this passionale has beautifully decorated letters beginning each story. The decoration served a purpose--to mark the beginning of each section for reading. In this book, the style of the decoration looks forward to later art of the period called Romanesque. The red title (rubric) informs the reader that the Passion of St Boniface ends and the story of St Alexis Confessor, celebrated on the 17th calends of July, begins. 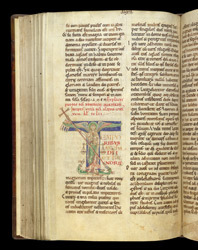 The first letter of his story, however, does not show him but St Michael the Archangel, who holds the scales to weigh the souls at the Last Judgement and spears the dragon below his feet. The inventiveness of the design--putting together harmoniously two separate events of the Archangel--is typical of the imaginative art of the 12th century.